This is a developing story and was was updated Oct. 2 at 6:30 p.m. with more information. POLL: Would stricter gun laws reduce America's violence? LATEST UPDATE: LAS VEGAS (AP) — The rapid-fire popping sounded like firecrackers at first, and many in the crowd of 22,000 country music fans didn't understand what was happening when the band stopped playing and singer Jason Aldean bolted off the stage. "That's gunshots," a man could be heard saying emphatically on a cellphone video in the nearly half-minute of silence and confusion that followed. A woman pleaded with others: "Get down! Get down! Stay down!" Then the pop-pop-pop noise resumed. And pure terror set in. "People start screaming and yelling and we start running," said Andrew Akiyoshi, who provided the cellphone video to The Associated Press. "You could feel the panic. You could feel like the bullets were flying above us. Everybody's ducking down, running low to the ground." Did Las Vegas gunman target other music festivals? While some concertgoers hit the ground, others pushed for the crowded exits, shoving through narrow gates and climbing over fences as 40- to 50-round bursts of automatic weapons fire rained down on them from the 32nd floor of the Mandalay Bay casino hotel. By Monday afternoon, 59 victims were dead and 527 injured in the deadliest mass shooting in modern U.S. history. "You just didn't know what to do," Akiyoshi said. "Your heart is racing and you're thinking, 'I'm going to die.'" The gunman, identified as Stephen Craig Paddock, a 64-year-old retired accountant from Mesquite, Nevada, killed himself before officers stormed Room 135 in the gold-colored glass skyscraper. The avid gambler who according to his brother made a small fortune investing in real estate had been staying there since Thursday and had busted out windows to create his sniper's perch roughly 500 yards from the concert grounds. The motive for the attack remained a mystery, with Sheriff Joseph Lombardo saying: "I can't get into the mind of a psychopath at this point." Paddock had 16 rifles — some of them with scopes — and a handgun in his hotel room, Lombardo said. Two were modified to make them fully automatic, according to two U.S. officials briefed by law enforcement who spoke on condition of anonymity because the investigation is still unfolding. At Paddock's home, authorities found 18 more guns, explosives and thousands of rounds of ammunition. Also, several pounds of ammonium nitrate, a fertilizer that can be turned into explosives such as those used in the 1995 Oklahoma bombing, were in his car, the sheriff said. The FBI said it found nothing so far to suggest the attack was connected to international terrorism, despite a claim of responsibility from the Islamic State group, which said Paddock was a "soldier" who had recently converted to Islam. In an address to the country, President Donald Trump called the bloodbath "an act of pure evil" and added: "In moments of tragedy and horror, America comes together as one. And it always has." He ordered flags flown at half-staff. With hospitals jammed with victims, authorities put out a call for blood donations and set up a hotline to report missing people and speed the identification of the dead and wounded. They also opened a "family reunification center" for people to find loved ones. More than 12 hours after the massacre, bodies covered in white sheets were still being removed from the festival grounds. The shooting began at 10:07 p.m., and the gunman appeared to fire unhindered for more than 10 minutes, according to radio traffic. Police frantically tried to locate him and determine whether the gunfire was coming from Mandalay Bay or the neighboring Luxor hotel. At 10:14 p.m., an officer said on his radio that he was pinned down against a wall on Las Vegas Boulevard with 40 to 50 people. "We can't worry about the victims," an officer said at 10:15 p.m. "We need to stop the shooter before we have more victims. Anybody have eyes on him ... stop the shooter." Near the stage, Dylan Schneider, a country singer who performed earlier in the day, huddled with others under the VIP bleachers, where he turned to his manager and asked, "Dude, what do we do?" He said he repeated the question again and again over the next five minutes. Bodies were lying on the artificial turf installed in front of the stage, and people were screaming and crying. The sound of people running on the bleachers added to the confusion, and Schneider thought the concert was being invaded with multiple shooters. "No one knew what to do," Schneider said. "It's literally running for your life and you don't know what decision is the right one. But like I said, I knew we had to get out of there." He eventually pushed his way out of the crowd and found refuge in the nearby Tropicana hotel-casino, where he kicked in a door to an engineering room and spent hours there with others who followed him. 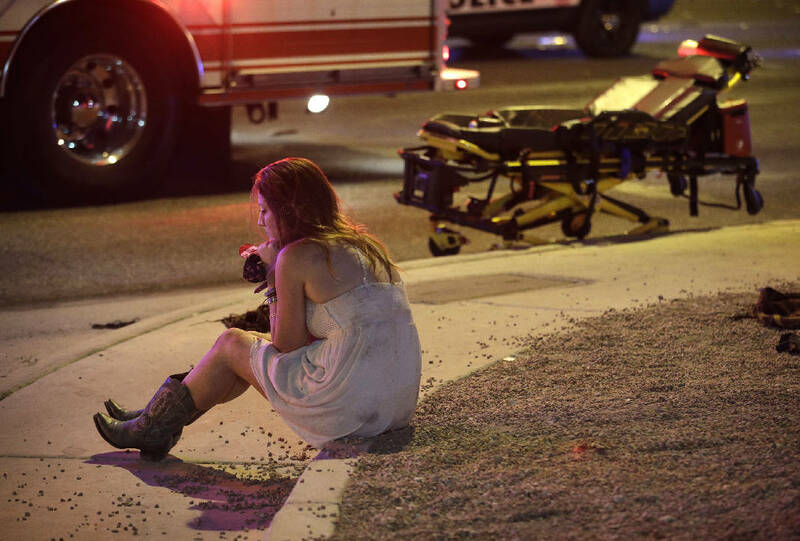 The shooting started as Aldean closed out the three-day Route 91 Harvest Festival. He had just begun the song "When She Says Baby," and the first burst of nearly 50 shots crackled as he sang, "It's tough just getting up." 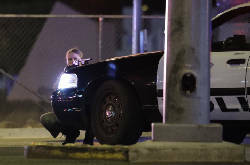 Muzzle flashes could be seen in the dark as the gunman fired away. "It was the craziest stuff I've ever seen in my entire life," said Kodiak Yazzie, 36. "You could hear that the noise was coming from west of us, from Mandalay Bay. You could see a flash, flash, flash, flash." Faces were etched with shock and confusion, and people wept and screamed. Tales of heroism and compassion emerged quickly: Couples held hands as they ran through the dirt lot. Some of the bleeding were carried out by fellow concertgoers. While dozens of ambulances took away the wounded, while some people loaded victims into their cars and drove them to the hospital. People fleeing the concert grounds hitched rides with strangers, piling into cars and trucks. Some of the injured were hit by shrapnel. Others were trampled or were injured jumping fences. 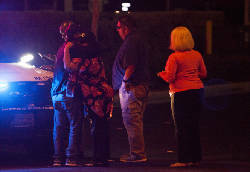 Las Vegas Mayor Carolyn Goodman said the attack was the work of a "crazed lunatic full of hate." The sheriff said authorities believe Paddock acted alone. While Paddock appeared to have no criminal history, his father was a bank robber who was on the FBI's most-wanted list in the 1960s. As for why Paddock went on the murderous rampage, his brother in Florida, Eric Paddock, told reporters: "I can't even make something up. There's just nothing." A suicide bombing at an Ariana Grande concert in Manchester, England, killed 22 people in May. Almost 90 people were killed in 2015 at a concert in Paris by gunmen inspired by the Islamic State. "My deepest condolences are with the victims and their families who suffered from the horrific event in Las Vegas. No one should fall victim at the hands of a person who wants to cause such harm and tragedy. This active shooter executed a calculated and terrifying plan that resulted in mass casualties. It is very hard for us to understand why a person would want to cause such tragedy. We must prepare ourselves for these types of events that are becoming more common. I want to remind our citizens that if you see or hear of something that does not look or feel normal and seems suspicious, report the information to your local law enforcement. Our department offers free active shooter training for groups in hopes of educating people on what to do if you are involved in an active shooter situation. I encourage our citizens to take advantage of the training and prepare for the unfortunate. Again, I extend my prayers to all who experienced this unconceivable event." ORIGINAL STORY: LAS VEGAS (AP) — A gunman perched on the 32nd floor of a Las Vegas hotel-casino unleashed a hail of bullets on an outdoor country music festival below, killing at least 50 people as tens of thousands of concertgoers screamed and ran for their lives, officials said Monday. It was the deadliest mass shooting in modern U.S. history. More than 400 other victims were taken to the hospital, authorities said. There was no immediate word on the motive for the Sunday night bloodbath. In the Mideast, the Islamic State group claimed responsibility for the attack and said the gunman was "a soldier" who had converted to Islam months ago. But it provided no evidence, and federal authorities said they were still investigating. Hospital emergency rooms were jammed with victims. President Donald Trump tweeted: "My warmest condolences and sympathies to the victims and families of the terrible Las Vegas shooting. God bless you!" Stay with the Times Free Press as more information becomes available.